Hi, thanks a lot for the prompt reply to my e-mail request and account approval on this forum! I decided to continue here, just in case anyone would need it in the future. We've installed D100+AP74+D10A+roll and pitch servos to a twin engine amphibian flying boat. The EDC-D10A is installed in the nose - absolutely no metal there, except for the temperature probe - seen on photo. It turned out that the roll servo as it came with the arm lever could not be easily installed "as is", we had to lathe a drum to convert it to capstan servo (it wasn't available at the time of purchase). The installation is show on the photo. The drum's diameter is 55 mm. Cables are tight enough - no free play. First thing that puzzled us is that servo test uses only around 1/3 of servo travel (both for roll and pitch), but Dynon tech support assured that it's ok for the test. Thanks! We set the magnetic inclination and intensity parameters for our place (see photo) and then calibrated EDC-D10A turning the plane around N/E/S/W. The pilot flew the plane with the default settings of the pitch and roll servo. The altitude was held very well, but the plane constantly wandered around the set heading bug. I suggested to increase the sensitivity and flew with the pilot next flight. Initial settings are shown on the photo. 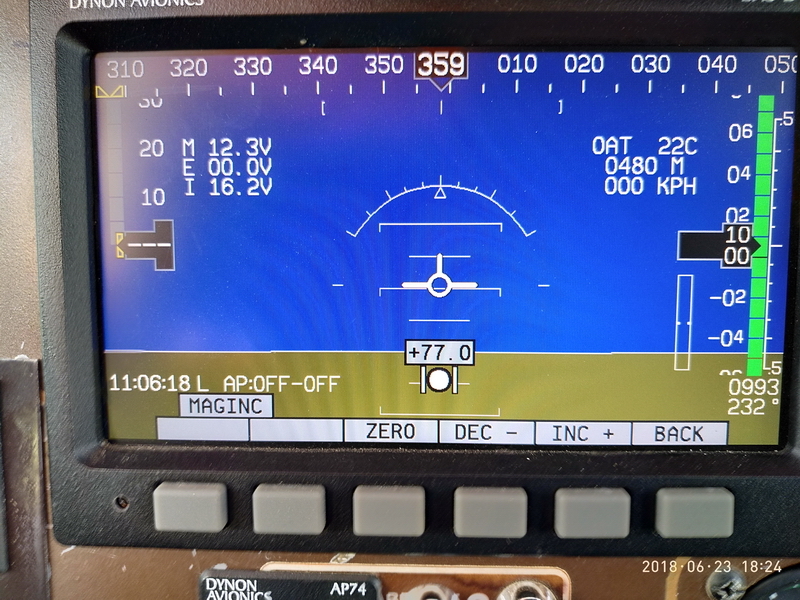 The plane still wandered, then we decreased the turning rate to 0 deg/sec to try the mode where AP only controlled the banking angle - the plane flew better, but still hunting around the heading bug. We tried decreasing sensitivity to 10 - no luck, increasing the turning rate to 2.5 - even worse (hunting became more aggressive), decreasing the bank limit to 5 deg - it still wandered but slower. Tried different combinations. We even tried to do the work for the AP holding the course to the heading bug with rudder, the funny thing is that the plane flew on course but AP didn't care to level the wings. It feels that as long as the heading is maintained it doesn't care about non-zero bank angle - just doesn't think it's necessary to intervene The plane when trimmed in calm air flies straight by itself - hands/feet off controls, but turning AP on causes swings to the sides. In a turn towards the heading bug it misses it, then turns back, sometimes at a near constant amplitude, sometimes it gradually increases. 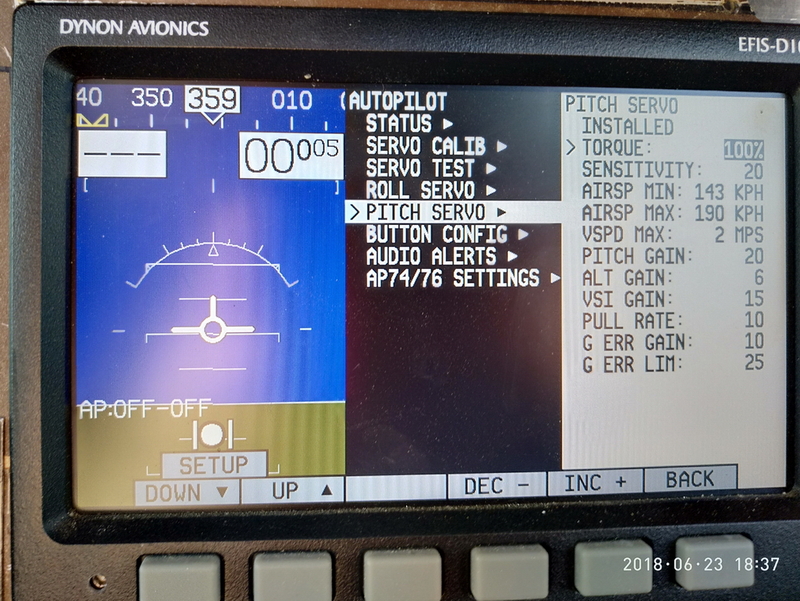 Well, so far not much use with the autopilot, the plane has to fly far north on Friday June the 29th for a month, and the autopilot is needed to help out in IMC. 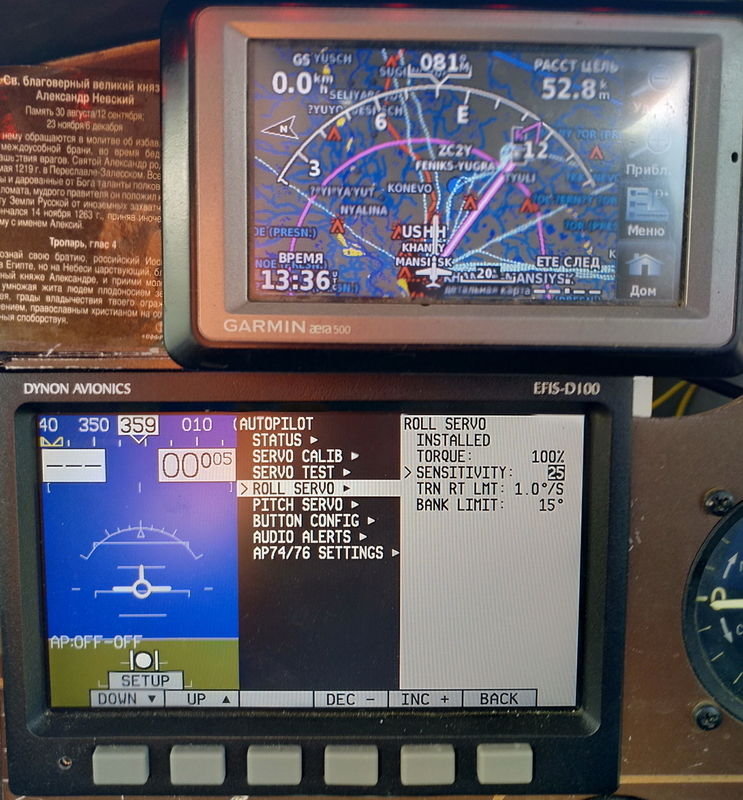 In fact navigation is not a problem - GPS works fine for this, but leveling in harsh and abrupt wind bursts in cloudy weather is the main task planned for the autopilot. Feels like it won't work out if it doesn't care about bank angle. I recorded that flight, will cut, comment and post the video tonight, hopefully Dynon tech experts would help to tame the plane under AP control. Heading mode is very sensitive to heading performance. 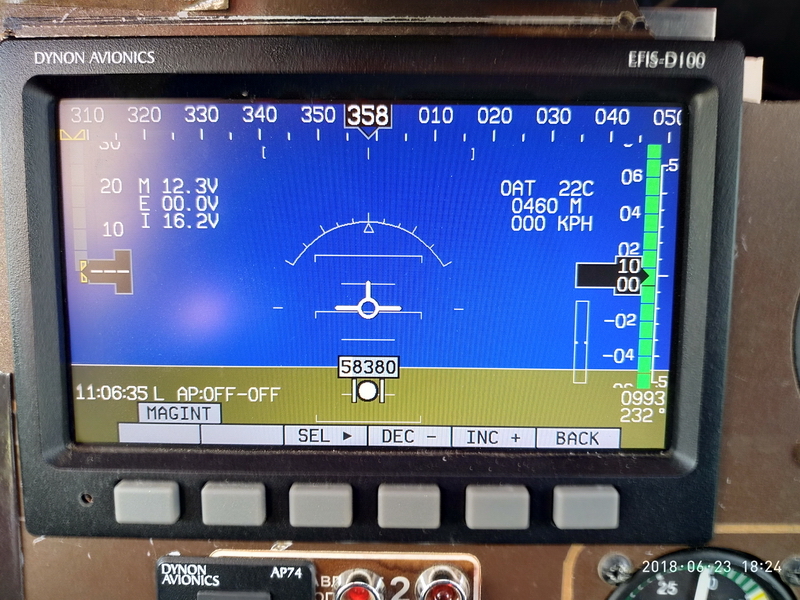 You look to have done all of the right things with your magnetic heading calibration, but just the same, if there's an issue with heading, heading mode will have trouble flying the airplane. Some people find that using GPS ground track mode (TRK) yields an instant improvement in performance. TRK and heading are similar - track mode follows the bug as a function of what direction the aircraft is flying, while heading manages it as a function of which way the aircraft is pointing. This is especially helpful in aircraft that have a lot of adverse yaw. I don't know the characteristics of your aircraft, but other experimental amphibs tend to have some. We'd recommend using the zero turn rate mode with the D100 series products. It uses a different algorithm entirely that is improved over the original. Did you try that with sensitivity higher than 10? Additionally, know that the AP will hold heading with wings not level if the ball is not centered. Also, if you're experiencing any slips while under autopilot control, that's going to lead to a lack of performance. So make sure that's not the case first. Hello, thanks for the advise! I processed and uploaded 6 out of 9 episodes of the in-flight video. The 3 remaining I will do later tonight, but to my opinion their results are worse / less practical. None of the servos slips during AP-controlled flight, this is definitely ruled out. How would it be centered with no rudder servo? If the wings are not level the ball most of the time would not be centered if rudder is not applied. We hope to get the right Garmin Aera cradle for serial connection today, so if lucky we'll have the option of TRK and GPS NAV modes to try. As for the adverse yaw... well, the pilot says he doesn't feel any, but on the video I see the ball leaning inside the turn, when AP banks the aircraft (I guess it could mean that the nose tries to get out of turn) - does it look like adverse yaw? The plane is very stable along all axis - it levels by itself, no problems in turns either. Could you confirm that the AP's algorithm does in fact control wings leveling even if the plane follows the heading bug? E.g. a wind bump can cause the plane to bank to a side but not necessarily change its heading at once (consider an ideal aerobatic roll with no change in heading and altitude). Will autopilot intervene to level the wings? I read that SkyView has leveling mode, but no mention of such in D-100 manuals. Ok, here are the videos and corresponding settings and heading deviatons. 1. Roll servo settings: sensitivity=25, turn rate limit=1, bank limit=15. Heading bug 68, heading errors (deg): +6, +9, -6, +9, -6. The ball is centered with rudder pedals at 02:09, heading errors: +3, +8, -6. Heading bug 243, heading errors: +1, -2, +8, -6, +5, -7. 2. Roll servo settings: sensitivity=10, turn rate limit=1, bank limit=15. Heading bug 254, heading errors (deg): -4, +1, 0, +8, -8, +4, -3, +7, 0, +7, +2, +6, -1, +15. Heading bug 020, heading errors: +9, -8, +3, -1, +7, -14, +7. 3. Roll servo settings: sensitivity=10, turn rate limit=0, bank limit=15. Heading bug 45, heading errors (deg): +1, -2, +1, -1, 0, -1, +1, +4, -8, +10. At 02:00 the heading is held with rudder pedals. 4. Roll servo settings: sensitivity=20, turn rate limit=0, bank limit=15. Heading bug 243, heading errors (deg): +2, -2, +1, -2, +11, -7, +4. At 01:22 the heading is held with rudder pedals, the wings are almost level. 5. Roll servo settings: sensitivity=15, turn rate limit=2.5, bank limit=15. Heading bug 051, heading errors (deg): -4, +8, -8, -7, +6, -8, +4, -2, 0, -2, 0, -2, 0, -4, +5, -5, +9. 6. Roll servo settings: sensitivity=15, turn rate limit=0, bank limit=5. Heading bug 256, heading errors (deg): -4, +7, -8, +10, -9, +11, -5. 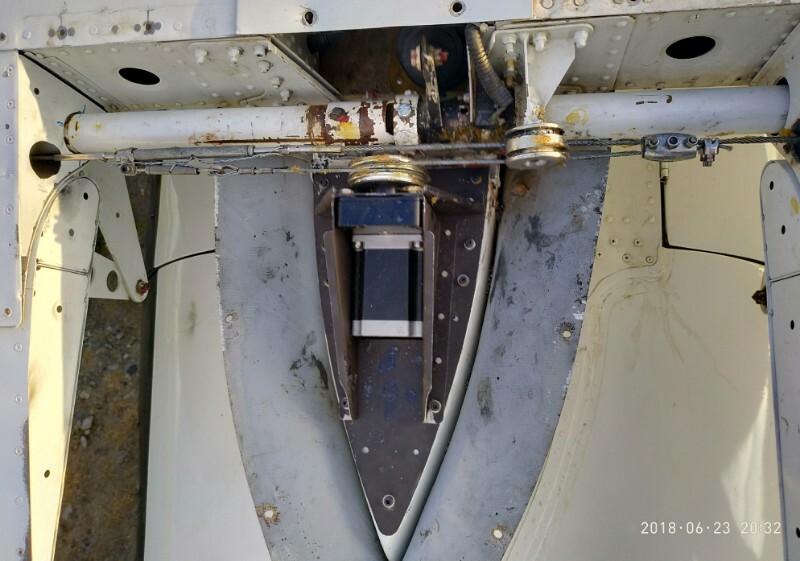 The ball is centered with rudder pedals at 02:29, heading errors: +3, -5, +3, 0, -3. Heading bug 081, heading errors: +3, -2, +2, -5, +3, 0, -4, 0, +3, -2, +7, +3, 0, +2, -13, +14, +7, +11, +4, +2. At 07:40 AP was turned off and the plane leveled by itself (well balanced) and flew a straight path with no intervention from the pilot (hands/feet off controls). To me sensitivity 10-15 with turn rate limit 0 and bank limit 15 look best so far. However they were tested in fairly good conditions, don't know how good they would be in IMC with stormy winds. P.S. We didn't set the IAS bug at first, I guess this is why the up-trim sign appeared. When the bug was set it didn't show up. Here are the last 3 pieces from that flight. 7. Roll servo settings: sensitivity=25, turn rate limit=0, bank limit=5. Heading bug 76, heading errors (deg): -1, +2, -5, 0, -2, 0, -2, +2, -4, 0, +1, -7, +6, -4. At 03:25 the heading is held by rudder pedals. At 03:46 AP is turned off, the plane is leveled to fly streight with no pilot control. At 04:12 AP is reengaged first in HDG mode, then at 4:16 in HDG-ALT mode. Since 4:28 the ball is kept centered with rudder. Heading bug 277, heading errors (deg): +7, -7, +5, +2, -3, +5, -1, +6, 0, -3, +7. 8. Roll servo settings: sensitivity=25, turn rate limit=0, bank limit=25. At 01:21 the ball was kept centered with rudder, heading errors: +7, -6, +4, +1, -2, 0, +4. Little deviations could be caused by not perfect ball centering with the rudder. 9. Roll servo settings: sensitivity=25, turn rate limit=1, bank limit=5. Sensitivity=9, heading errors: +6, -8. I don't know if sensitivity change has any effect until we press the back button, heading errors with sensitivity 15 and 9 recorded with the aileron servo setup page open. AP operation was not interrupted during sensitivity change. So I think at this point I'll need to refer you to our actual technical support team at support at dynonavionics dot com. We try to be helpful on the forum, but once things get deeply technical and individualized, we like to have you work with our support team directly to work through individual aircraft issues.